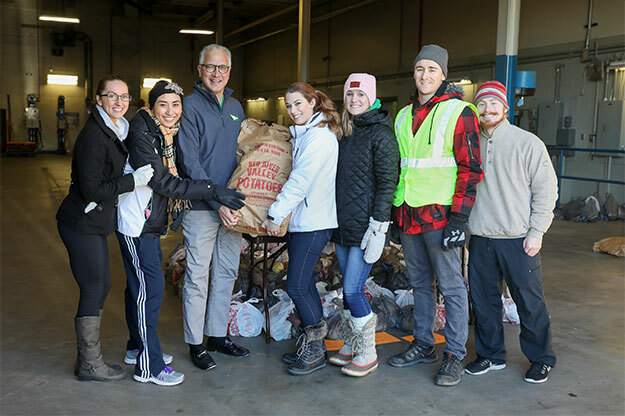 UND President Mark Kennedy takes a moment to help members of UND’s Mortar Board prepare thousands of Thanksgiving dinner baskets for delivery to local families in need on Saturday, Nov. 19, at the UND Transportation Building. Left to right: Kayla Sendelbach, Monica Gamboa, President Kennedy, Holly Mitzel, Haylie Rants, Luke Shields, Walker Romens. Photo by Shawna Schill. It’s not Thanksgiving without turkey and all the trimmings. However, some families in Greater Grand Forks just aren’t able to afford the ingredients for the feast. “It’s not easy to say you need help,” said Kristi Okerlund, UND’s coordinator of new student and parent programming and advisor to the Mortar Board Honor Society on campus. That’s why, for 37 years, the student members of Mortar Board have raised money and then purchased turkeys and all the trimmings to give recipients the recipe for a Happy Thanksgiving. 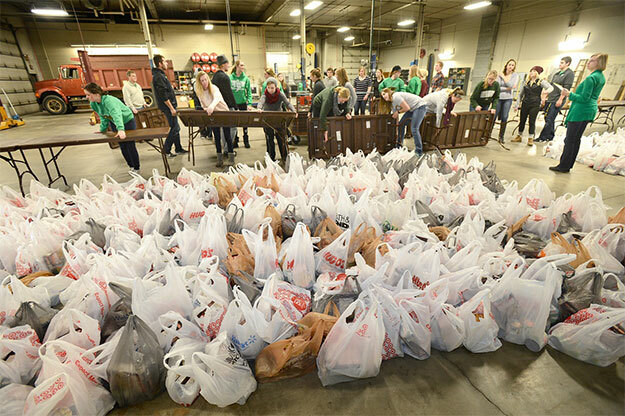 This year, 40 UND students raised $20,000 to provide Thanksgiving turkey baskets to 1,200 local families. Just 40 seniors are accepted into Mortar Board each year. The fundraising is a nearly year-round effort, and each student member must raise at least $300. 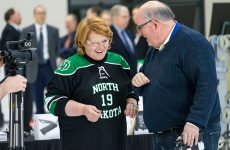 They request assistance from businesses, work at the Alerus Center as ushers, clean the Ralph Engelstad Arena after events, and hold food drives. 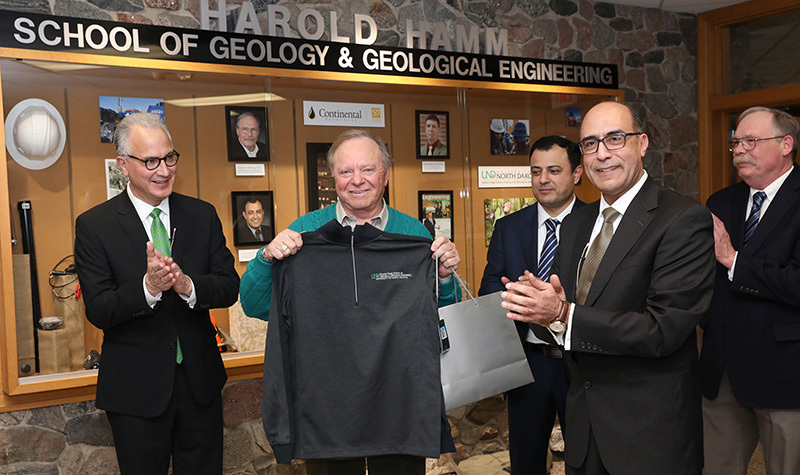 “Cleaning The Ralph is quite a job,” Mitzel said. 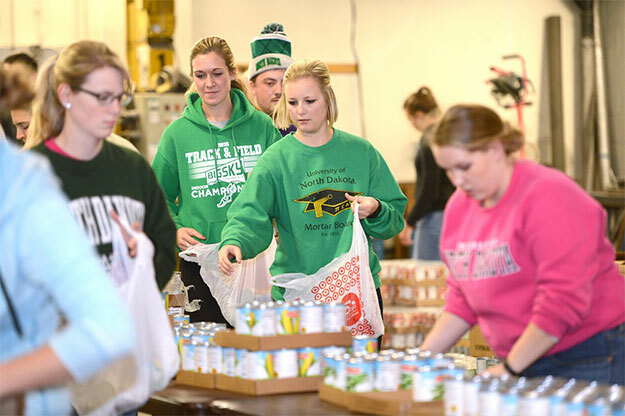 For the past 37 years, the student members of UND’s Mortar Board have raised money and then purchased turkeys and all the trimmings to give local families in need the recipe for a Happy Thanksgiving. Photo by Jackie Lorentz. Mitzel added that they also do profit-sharing with restaurants, use “go fund me” pages online, and use social media to raise money. “Some students even went door-to-door,” said Okerlund. The project also involves the campus, from use of the Transportation Building to distribute the baskets to a special Denim Day for charity that raises more money than any other Denim Day all year. All that work pays off the weekend before Thanksgiving. This year, the students rented a large moving truck and loaded 5,000 pounds of potatoes. Then they bought stuffing mix, cranberries, pie filling and vegetables from a local grocery store, and delivered all the food to the Transportation Building on campus. A 7 a.m. Saturday, they picked up the frozen turkeys and pie crusts and took them to the Transportation Building. This year, Mortar Board members rented a large moving truck and loaded 5,000 pounds of potatoes. Then they bought stuffing mix, cranberries, pie filling and vegetables from a local grocery store, and delivered all the food to the Transportation Building on campus for deliver to local families. Photo by Jackie Lorentz. Then came the fun part: Starting at 10 a.m. Saturday, families drove into the Transportation Building, and students loaded their cars with all the fixings for a Thanksgiving feast. 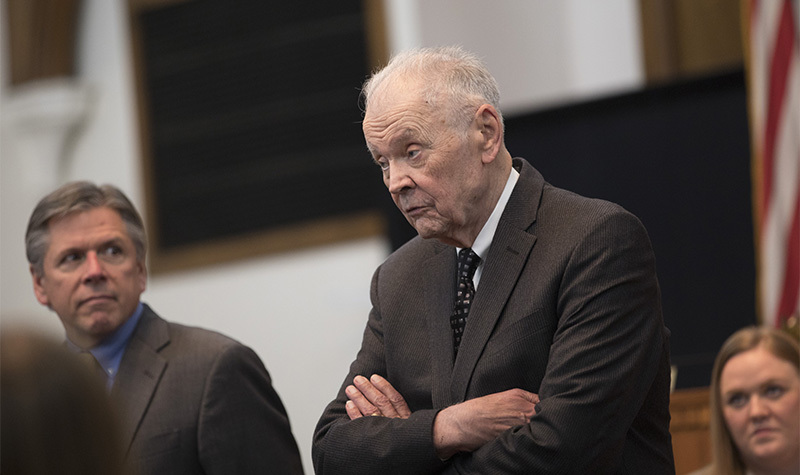 Okerlund said that recipients sign up through school social workers, places of worship and government programs, and through agencies such as the Salvation Army, Lutheran Social Services and the Grand Forks Housing Authority. A national honor society, Mortar Board recognizes seniors for their scholarship, leadership, and service, and provides opportunities for more leadership and service. The national organization was founded in 1918, and there are more than 231 chapters at universities across the nation. At UND, the top 35 percent of the senior class, around 1,000 students, receive a letter inviting them to apply to Mortar Board. Of those who apply, just 40 are selected. UND’s chapter just received a Gold Torch Award in September, recognizing them as one of the most outstanding chapters in the nation.